I hadn't realized until recently, when Dena / PMG made posts about it, that PCGS Currency had shut down. I also hadn't realized, until I read the announcement on the PCGS Currency page, that PCGS Currency wasn't run / operated by / part of Collector's Universe. If I'm being completely honest, I never really spent any time looking into PCGS currency, so I don't know if my lack of knowledge in that department was from my lack of effort or them not advertising it / publicizing it much. I never bought a PCGS currency graded note so it just never came up for me. The thing that's particularly interesting to me about this is, you're not seeing this shutdown reflected in listings in at least some marketplaces - eBay in particular. PCGS Currency graded notes are still being listed with prices / premiums that don't seem to take into account the changed status of these notes and the guarantee they maybe used to have. "On 3rd party professional graded notes: we are selling what that company says it is and not what the buyers or sellers opinion of the grade(condition of the note) If you don't know how to grade please contact the grading company or look at their website to understand their grading standards." Anyone that goes to the PGCS Currency page expecting to see information about grading standards is going to be disappointed. Based on NGC's post, I'm sure those with high-end notes graded by PCGS Currency are mostly aware of this shake-up and are doing what they feel they need to do - that is mostly out of my depth anyway. I shop and live in a different part of the market - lower cost modern notes that are graded because I want to have them graded, not because the value of the note justifies the expense of grading them. It's going to be interesting to see the extent to which the closure of PCGS currency will be felt on this lower end portion of the market - will these already fairly low-value notes actually start trading at a discount against similar PMG graded notes? I'm expecting that the notes in these cases will probably stay in the PCGS currency holders and will not be crossed to PMG. 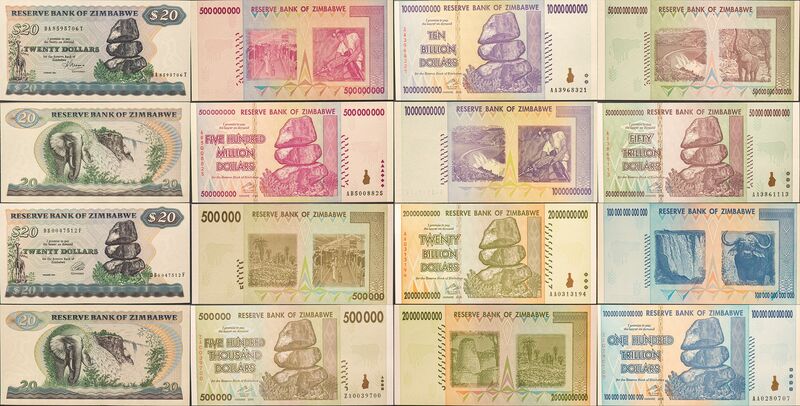 Paying to crossover a rare and valuable note makes sense, but, with things like this, like my Zimbabwe notes, most of them didn't make sense to grade in the first place and it really doesn't make sense to pay more money to cross them. The value of the grading with these things is mostly in the holder and the protection that the holder conveys for long term preservation and handling. The PCGS Currency holders satisfy this need, probably to roughly the same extent as the PMG holder would. For what it's worth, I'm really not trying to dump on PMG graded Zimbabwe notes - I really like my set and I've been working hard to build it up. But I'm not unwilling to acknowledge facts and math - most of these notes sell for $3 raw and about $16-25 graded in the range of 66 EPQ to 68 EPQ. So, even if you get a great grade on the note, you're barely going to recover your grading and shipping costs if you try to sell the note later - at least under current market conditions. Maybe that'll change one of these days. Just a bit of an evening ramble I suppose, but I'll stop there for now.